Paul Harrold is the Technology Manager in Castrol for lubricants used in the Marine business. In this role he leads teams responsible for the formulation development, product evaluation and technical support for engine and other equipment lubrication needs. He also provides technology leadership and guidance on the Castrol Marine leadership team. Paul joined Castrol in 2005 to lead the team of chemists responsible for developing Castrol's marine grades after 13 years working in the chemical additive industry. Prior to Castrol, Paul worked at Lubrizol, the world’s largest additive supplier, as a Technology Manager where his responsibilities included developing additive systems for Marine, Passenger Car, Heavy Duty Diesel and Motorcycle engine oils. Before joining Lubrizol Paul was a logistics officer in the armed forces specialising in fuels and lubricants supply. During his time in the armed forces Paul served in various supply roles in UK, Germany and Iraq. He has spent over 20 years in the field of lubricant development for use in marine engines and served as Chairman of the CEC Large Engine Lubricants working group in 2001. Paul holds a University Degree in Chemistry from the University of Manchester. Tighter regulations covering sulphur emissions, which imposes limits on the sulphur content of the heavy fuel oil (HFO) burned has become an important consideration for many shipping companies seeking the most efficient cylinder oil feed rate to lubricate their two-stroke crosshead main engines. Operating on reduced power (slow steaming) in pursuit of lower bunker consumption is now commonplace within the industry. Its adoption, and the accompanying risk of cold corrosion, has introduced a further variable, making it more complex to calculate which cylinder oil offers the most efficient lubrication solution. More recently changes to engine design – such as a longer stroke – have been introduced to reduce fuel consumption, but are also contributing to increased cylinder liner corrosion. At the same time, increased combustion pressures, in combination with cooler cylinder liners, impact the acid dew point on specific regions of the liner, leading to increased condensation of sulphuric acid. It is well-known that engines operated at the lower loads associated with slow steaming may not achieve optimal cylinder liner temperatures. Under such conditions, there is a significantly higher risk of suffering increased corrosion on piston rings and liners as a result of the condensation of sulphuric acid formed from the sulphur oxides and water produced by burning HFO. The risk is further increased when using fuel with a sulphur content over 2.5%. Increased corrosive wear leads to a shorter lifespan of key parts, causing premature and costly liner and ring pack replacement. The unplanned replacement of a single liner, piston crown refurbishment and ring pack can cost up to $90,000, thus avoidable corrosive wear can lead to a substantial bill of several hundreds of thousands of dollars. As a consequence, leading OEMs MAN and Wärtsilä, have issued new service letters limiting the use of mid-range BN oils on certain engine types and strongly recommending cylinder lubricants with a minimum BN of 70, and preferably higher. To counter the risk of corrosion from sulphuric acid condensates, marine cylinder oils are formulated with a higher alkalinity (BN) than found in other lubricants: typical automotive engine oils may be in the 8-15 BN range, for example, while current marine cylinder lubricants are typically of 40-80 BN. 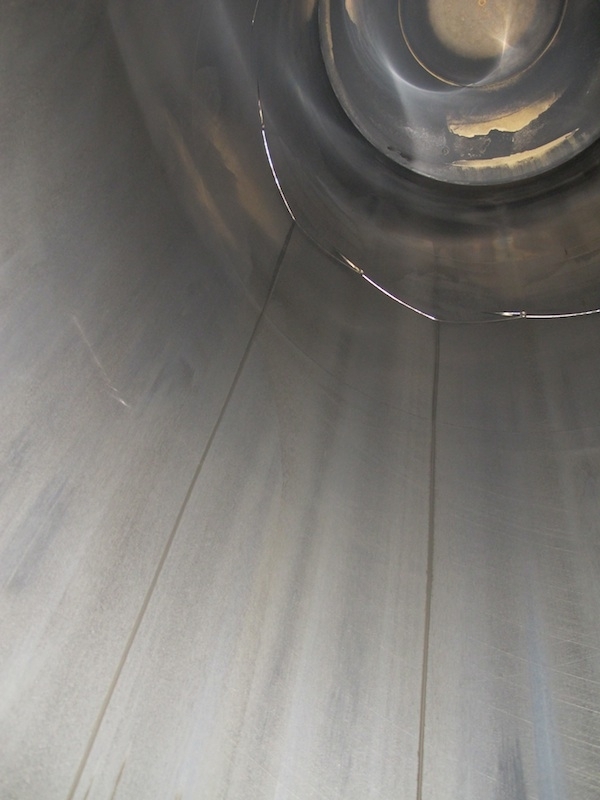 Selecting a cylinder lubricant of insufficient BN to match the prevailing operating conditions – engine type and load, lubricant feed rate and fuel sulphur content – can result in higher rates of corrosion. A lower engine load results in less fresh lubricant being injected over a given time; lubricant residence time is thus increased and reduced lubricant refreshment occurs. As the capacity of a cylinder oil to neutralise any acidic species formed by combustion depends on the alkali (BN) concentration present and the lubricant replenishment rate, an oil under slow steaming conditions (hence more acidic condensates) has to neutralise for longer periods. Therefore, a higher BN lubricant with optimised detergency properties provides greater protection. Optimum, cost-effective engine protection can be achieved by choosing the most appropriate product from a range of cylinder lubricants. Castrol’s Cyltech 80AW product was promoted in 2012 as a solution to the increased corrosive wear experienced in the field; its higher BN of 80 enables use at the minimum OEM-recommended feed rates across the widest range of available fuel-sulphur contents, even up to 3.5%. Significant advantages have been demonstrated by higher base number (BN) oils over cylinder lubricants with lower BNs in reducing ship running costs under severe engine operating conditions such as slow steaming. Case studies carried out by Castrol demonstrate the harmful effects of selecting a cylinder oil of inadequate BN to match the engine operating conditions, and also how higher BN lubricants can reduce corrosive wear with lower feed rates than those required for lower BN oils. Valuable data on the performance of high-BN cylinder oils, in terms of corrosion prevention and piston and ring zone cleanliness in a challenging operating environment, is provided by four large containerships in longhaul service with a major container shipping company. Each vessel is powered by a Wärtsilä RT-flex96C low speed two-stroke engine with ten or eleven cylinders. The ships, operating under very severe conditions (high-sulphur fuel and low engine load with one turbocharger blanked off), have been monitored over several months. All started out with a mid-BN cylinder oil lubricating the 960mm-bore engines, however extreme corrosive wear was noted, indicating that liner replacements would be necessary after just a third of their expected life. Two of the ships were then switched to Castrol Cyltech 80 AW. Typically a liner is designed to last for 70,000 running hours. Taking the example of a vessel life of 25 years with 150,000 running hours, this would require one liner replacement throughout the lifetime of the vessel. With an estimated cost per liner replacement of $70,000, the ship owner would be required to spend $0.7 million for one replacement of ten cylinders. Shortening the liner life to one third would result in 5 liner replacements in the same time period, increasing the costs to $3.5 million. In these case studies, the switching of the two vessels to an 80 BN lubricant should mitigate excessive corrosive wear and hence potential unplanned costs of $5.6 million over 25 years ($224,000 annually) solely in liner replacement and not taking into account the costs for ring packs. In the case at hand, Castrol Marine was able to draw comparisons based on moving from mid-range BN to 80 BN oils as well as from observing the ongoing effects on engines remaining on mid-range products. It was found that introducing Castrol Cyltech 80 AW had an immediate impact on arresting corrosive wear. Iron contents in scavenge drain oils were found to have reduced from nearly 400 parts per million (ppm) with the mid BN products to less than 100 ppm with Cyltech 80AW. An opportunity to evaluate two units with similar running hours, respectively served by mid-BN and 80 BN cylinder lubricants, showed that piston crown, crown land and ring land deposits were also significantly cleaner with the higher BN product. Higher resistance to corrosive attack was thus accompanied by enhanced detergency, keeping the ring zone and crown land cleaner. Furthermore, engine inspections over 3,000 hours, following the switch to Castrol Cyltech 80AW, showed a progressive clean-up of existing deposits and generally improved cleanliness of the ring zone. The case study will now focus on achieving further savings by reducing the cylinder oil feed rate by 10%. It is estimated that this will save a further $100k per annum ($2.5 million over 25 years) for the two vessels increasing the annual saving to approximately $324k together with the reduction in cylinder liner replacement. i also run a shipping company.i found this post useful.thank you for posting.best luck.keep sharing this kind of information,i will go through that to update myself.